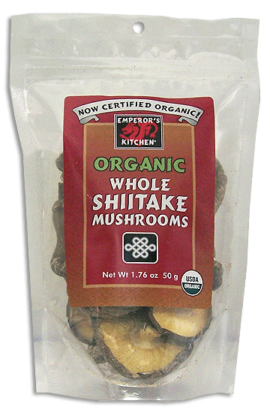 Emperor’s Kitchen Organic Dried Whole Shiitake Mushrooms are grown in Qingyuan County in a remote area of Zhejiang Province to strict Chinese Government Organic Standards. These standards require Chinese organic farms to be located far away from industry, mining, and intensive modern, chemicalized agribusiness, especially rice cultivation and feedlot animal husbandry, as well as areas of high population density. American and European Organic Standards make no such provision, allowing organic farms to produce in areas closer to urban markets to reduce ecological transportation costs.